Research by Food Network reveals that one in five Brits say the humble pig in blanket is the best part of the Christmas dinner, and one in four say Christmas would be ruined without them. 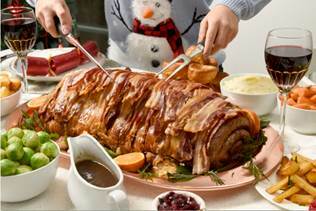 So Food Network celebrates its Christmas programming by creating the giant pig in blanket centrepiece. 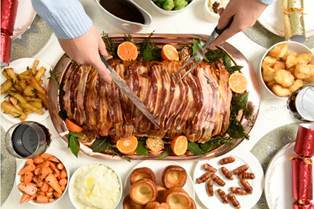 The whopping 10kg creation is made up of 45 linked organic, gluten-free pork sausages, sandwiched together by two Cumberland rings all wrapped up in 70 strips of streaky pancetta bacon rashers, that’s 16 metres of bacon, three times the height of the average UK house and can feed a festive party of 24 making this the perfect centrepiece for pig in blanket loving family and friends this Christmas. Food Network has gone whole hog with its latest creation to celebrate its equally extravagant line-up of Christmas programming this festive season. Christmas is a month full of love for food and Food Network has plenty to inspire you this festive season. Programmes include; 12 Chefs of Christmas, Cooking Christmas with Matt and Lisa, Giada’s Holiday Handbook, Denise Van Outen’s Christmas and plenty more. It is sure to be a Christmas to remember. The pig in blanket centrepiece is available to order in a variety of sizes from East London’s Appetite butchery up until the 15th December, starting from today.